A Maryland state senator voted against a bill, which would have been detrimental to the corporate client, whom his wife represented during the 2014 legislative session. According to state lobbying records Pamela Kasemeyer, a registered lobbyist for Scwartz, Metz & Wise, represented Pioneer Green, a Texas-based developer seeking to construct a wind farm in Somerset County. During the legislative session, the southern Maryland delegation introduced legislation, HB 1168, to put a moratorium on the Great Bay Wind project, which they feared would interfere with Patuxent Naval Air Station’s radar testing operations. 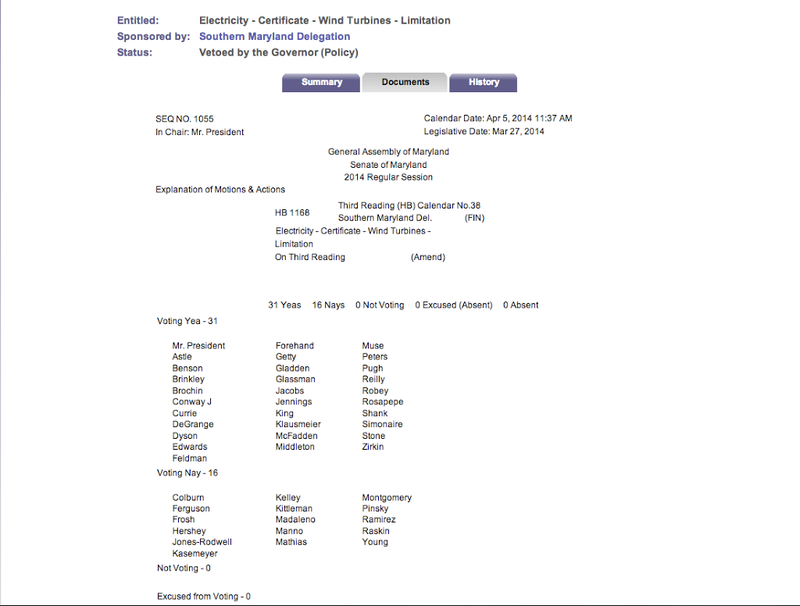 Kasemeyer’s husband, State Senator Ed Kasemeyer (D-Howard County) voted against HB 1168, meaning he voted in the direct interest of his wife’s client. The bill passed the legislature, but Governor O’Malley vetoed it, allowing the wind farm project to continue. 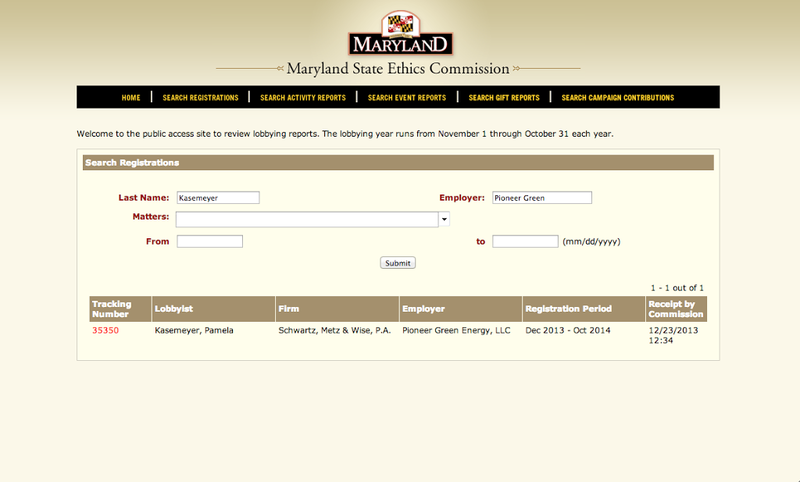 According to the State Ethics Commission’s lobbyist list for 2014, Pamela Kasemeyer represented 26 other clients in addition to Pioneer Green, including large pharmaceutical manufacturers, Eli Lilly, and Merck, state-based healthcare special interest groups, and Baltimore Gas and Electric. In 2013, the latest year for which the State Ethics Commission’s Annual Lobbying Report is available, Kasemeyer earned over $600,596 in compensation from her clients. Kearney-O’Doherty Public Affairs, the politically influential consulting firm, who is assisting O’Malley’s presidential bid, are also working for Pioneer Green on the Great Bay Wind project.